In this example notebook we show how to use WMS and WCS services provided by Sentinel Hub to download satellite imagery. We describe how to use various parameters and configurations to obtain either processed products or raw band data. We start with examples using Sentinel-2 L1C data and then show how to also obtain Sentinel-2 L2A, Sentinel-1, Landsat 8, MODIS and DEM data. In order to use Sentinel Hub services you will need a Sentinel Hub account. If you do not have one yet, you can create a free trial account at Sentinel Hub webpage. If you are a researcher you can even apply for a free non-commercial account at ESA OSEO page. Once you have the account set up, login to Sentinel Hub Configurator. Inside there will already exist one configuration with an instance ID (alpha-numeric code of length 36). For this tutorial it is recommended that you create a new configuration ("Add new configuration") and set the configuration to be based on Python scripts template. Such configuration will already contain all layers used in these examples. Otherwise you will have to define the layers for your configuration yourself. Note: matplotlib is not a dependecy of sentinelhub. Utility function for plotting RGB images. All requests require bounding box to be given as an instance of sentinelhub.geometry.BBox with corresponding Coordinate Reference System (sentinelhub.geometry.CRS). In our case it is in WGS84 and we can use the predefined WGS84 coordinate reference system from sentinelhub.geometry.CRS. In case you are not using a configuration based on Python scripts template you will now have to create a layer named TRUE-COLOR-S2-L1C yourself. In Sentinel Hub Configurator go to your configuration, add new layer which will use Sentinel-2 L1C data source and predefined product TRUE COLOR, RGB Visualization for Data processing parameter. All of the above arguments are obligatory and have to be set for all WmsRequest. Method get_data() will always return a list images in form of numpy arrays. Returned data is of type = <class 'list'> and length 1. In order to get the latest Sentinel-2 acquisition set the time argument to 'latest'. The latest Sentinel-2 image of this area was taken on 2018-07-08 07:12:19. In case a part of the image above is completely white that is because the latest acquisition only partialy intersected the specified bounding box. To avoid that we could use a time_difference parameter described in Example 8. In order to get all Sentinel-2 acquisitions taken in a certain time interval set the time argument to tuple with two elements (start date,end date). 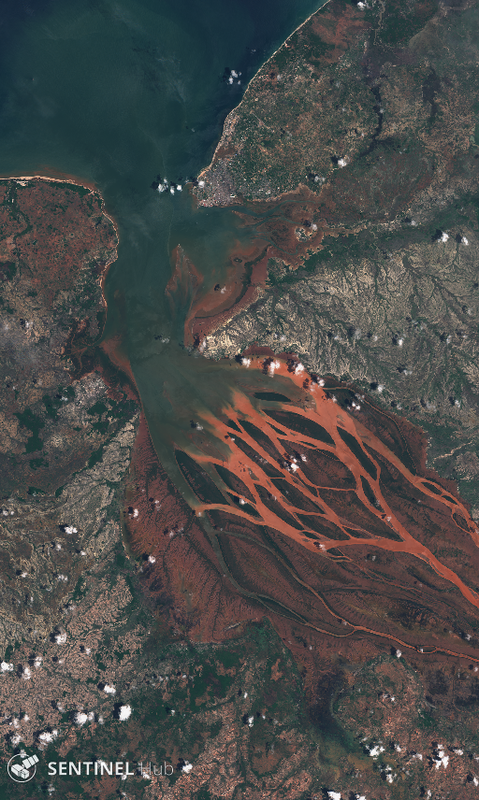 There are 6 Sentinel-2 images available for December 2017. In order to get only Sentinel-2 acquisitions with cloud coverage less than certain amount set maxcc argument to that value. Note that this cloud coverage is estimated on the entire Sentinel-2 tile and not just for the region defined by our bounding box. There are 2 Sentinel-2 images available for December 2017 with cloud coverage less than 30%. Now let’s use a layer named BANDS-S2-L1C which will return all Sentinel-2 spectral bands with raw values. We have to set the image_format argument to sentinelhub.constants.MimeType.TIFF_d32f, since we can’t pack all Sentinel-2’s 13 bands into a png image. This format will also ensure that we will get image reflectance in 32-bit float values. All downloaded data can be saved to disk and later read from it. Simply specify the location on disk where data should be saved (or loaded from) via data_folder argument of request’s constructor and set the argument save_data of get_data method to True. The output directory has been created and tiff file with all 13 bands was saved. Since data has been already downloaded the next request will read the data from disk instead of downloading it. That will be much faster. If you need to redownload the data again, just set the redownload argument of get_data() method to True. The get_data method returns a list of numpy arrays and can save the downloaded data to disk, as we have seen in the previous example. Sometimes you would just like to save the data directly to disk for later use. You can do that by using save_data method instead. This time instead of png images let’s download 16-bit tiff images. The output directory has been created and tiff files for all 6 images should be in it. If the bounding box spans over two or more Sentinel-2 tiles and each of them has slightly different time stamp, then download request will be created for each time stamp. Therefore we will obtain two or more images which could be completely the same or partialy blank. It depends on whether the tiles from the same orbit are from the same or from two different data strips. Let’s look at the specific example. Again, we’re going to look at Betsiboka estuary, but we’ll increase the bounding box so that we cover an area of two different Senteinel-2 tiles. Clearly these are the same images and we usually would want to get only one. We can do that by widening the time interval in which two or more download requests are considered to be the same. In our example it is enough to widen the time window for 10 minutes, but usually it can be up to two hours. This is done by setting the time_difference argument. The use of WcsRequest is exactly the same as of the WmsRequest shown above. The only difference is that instead of specifying image size we specify the spatial resolution of the image. We do that by setting the resx and resy arguments to the desired resolution in meters. E.g. setting resx='10m' and resy='10m' will return an image where every pixel will cover an area of size 10m x 10m. Every other parameter described in this tutorial will work the same for WMS and WCS requests. Sentinel Hub OGC services have various custom URL parameters described at the webpage. Many of them are supported in this package and some of them might be added in the future. Let’s check which ones currently exist. Many of these parameters are already appear in Sentinel Hub Configurator as a property of an instance or a layer. However any parameter we specify in the code will automatically override the definition in Configurator for our request. We can request true color image with atmospheric correction, transperency layer and and no logo. Obtained true color images have a transparency channel indicating which parts of the image have no data. Let’s implement a simple cloud detection algorithm. Note: We still had to specify an existing layer from Configurator. That is because each layer is linked with it’s data source and we cannot override layer’s data source from the code. Let’s select a script for calculating moisture index and provide its URL as a value of parameter CustomUrlParam.EVALSCRIPTURL. Use a configuration based on Python scripts template or create a new layer in Sentinel Hub Configurator that is defined to use desired satellite data source. Set the layer parameter of WmsRequest or WcsRequest to the name of this newly created layer. Set data_source parameter of WmsRequest or WcsRequest to the same data source (using one of the objects from the list above). When you have a layer named TRUE-COLOR-S2-L2A in your configuration let’s try to obtain some level 2A images. Unfortunately L2A images are being processed only for some regions around the globe and Betsiboka Estuary is not one of them. Instead let’s check Eyjafjallajökull volcano on Iceland. This time we will provide coordinates in Popular Web Mercator CRS. Request using Mapzen DEM as a data source does not require a time parameter. To view Landsat 8 L1C image we require a layer TRUE-COLOR-L8 with predefined true color RGB template.